Duffy Counseling Center works with individuals, families, and youth to feel better and achieve more in every aspect of life. Since 2012, the Duffy Counseling team has worked together to help kids, teens and adults towards creating more productive and satisfying lives. “We sure didn’t start out to create a family business,” says Matthew, a former high school All-American and Division 1 college athlete. Matthew offers particular expertise with ADD/ADHD, anxiety, depression and sports performance. Patrick is a cancer survivor and knows firsthand the behavioral impacts and life transformation for families dealing with disease and other issues. “We each have our own unique experiences to offer, but I particularly enjoy working with kids, adults and families coping with the effects of addictions, mental illness, substance abuse, anxiety and mood disorders,” he says. Katharine regularly works with children, teens and adults in hospital, residential and outpatient settings. “With anyone I see, the goal is to help them feel self-worth and make progress toward a healthy and meaningful life,” she says. She has worked in areas of domestic violence, sexual abuse and opiate addictions, among other areas. As a mom to young children and a military spouse, Katharine offers a broad understanding of women’s issues and developmental counseling, guidance and consulting for growth and development from childhood to adulthood. 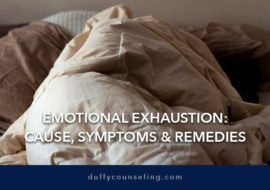 Conveniently located on Chain Bridge Road in McLean, Duffy Counseling Center offers a variety of counseling and mental wellness services for today's adults, children, and families. Teletherapy and support groups on a variety of different topics are also available.